We’ve had a few days full of new experiences! It started with KTV- a lip syncing competition for all aydot (units), run completely by our very own Kerem ’15! Each bunk in the aydah chose a song from the theme Kerem assigned. To give you an idea, some themes were Broadway, boy bands, or TV shows. The night was a big success and everyone did a great job! 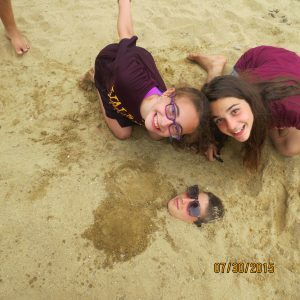 Mazal tov to our lower camp winners- G4! 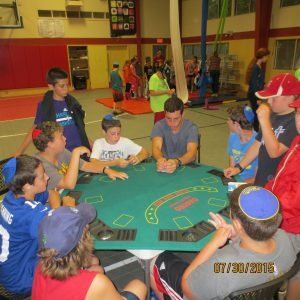 Thursday was our favorite day of the week-achla yom (trip day)! K’firim went to Weirs Beach , swam in the nice, cool water, went to get Gifford’s ice cream, and got back to camp around 5 pm. To finish the day with high energy and smiles on our faces, we had erev Casino (Casino Night)! The chanichim (campers) got paper clip currency and moved between different tachanot (stops) to try and win as much as possible! They bet on which madrich could get the most chocolate chips out of a plate full of flour, did balloon sumo wrestling, and played some classic Poker and Blackjack. The chanichim had a blast, and so did we! We wish everybody Shabbat Shalom and a great sof-shavua (weekend)!